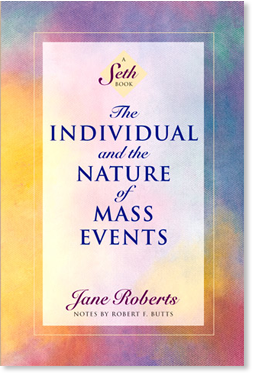 Speaking exclusively through Jane Roberts, Seth has repeatedly stressed the concept that we create our own reality according to our individual beliefs. But how do our realities merge and combine to form mass reactions such as the overthrow of governments, the birth of a new religion, wars, epidemics, earthquakes, and new periods of art, architecture, and technology? In this pioneering work, Seth explores the connection between personal beliefs and world events. He pinpoints the unconscious — and often negative — beliefs pervading science and religion, medicine and mythology, and offers thought-provoking reflections on Darwinism, Freudianism, religions, cults, and medical beliefs. “You make your own reality.” That statement is one of the cornerstones of Seth’s material, stated almost from the beginning of our sessions and emphasized throughout his books. In Mass Events, though, Seth goes further, maintaining that our private impulses are meant to provide the impetus for the development of our own abilities in a way that will also contribute to the best interests of the species and the natural world as well. He’s speaking of our normal impulses here, those that we’ve been taught are dangerous, chaotic, and contradictory. Seth maintains that we can’t trust ourselves while distrusting our impulses at the same time. Much of this book is concerned with the purposes of our impulses, and the reasons for their poor reputations in the eyes of science and religion. What Seth is really saying here is that our impulses are meant to help us create our own realities on a personal basis in a way that will enhance both our private lives and our civilizations. You cannot begin to understand the nature of mass events of any kind unless you consider the even greater framework in which they have their existence. A person’s private experience happens in the context of his psychological and biological status, and basically cannot be separated from his religious and philosophical beliefs and sentiments, and his cultural environment and political framework . . .
All of the issues form together to make a trellis of behavior. Thorns or roses may grow therein. That is, the individual will grow outward toward the world, encountering and forming a practical experience, traveling outward from his center in almost vinelike fashion, forming from the fabric of physical reality a conglomeration of pleasant or aesthetic, and unpleasant or prickly events. The vine of experience in this analogy is formed in quite a natural fashion from “psychic” elements that are as necessary to psychological experience as sun, air, and water are to plants. I do not want to get too entwined in this analogy, however; but as the individual’s personal experience must be seen in the light of all of these issues, so mass events cannot be understood unless they are considered in a far greater context than usual. The question of epidemics, for example, cannot be answered from a biological standpoint alone. It involves great sweeping psychological attitudes on the part of many, and meets the needs and desires of those involved — needs which, in your terms, arise in a framework of religious, psychological and cultural realities that cannot be isolated from biological results. . . . I said there are no closed systems. This also means that in world terms, events spin like electrons, affecting all psychological and psychic systems as well as biological ones. It is true to say that each individual dies alone, for no one else can die that death. It is also true that part of the species dies with each death, and is reborn with each birth, and that each private death takes place within the greater context of the existence of the entire species. The death serves a purpose species-wise while it also serves the purposes of the individual, for no death comes unbidden. An epidemic, for example, serves the purposes of each individual who is involved, while it also serves its own functions in the greater species framework. Chapter 7: The Good, the Bad, and the Catastrophic. Jonestown, Harrisburg, and When Is an Idealist a Fanatic?